Dealer Lab and Dealer E-Process has developed the first customizable Vehicle Details Page (VDP) in the automotive industry in order to solve a problem for most dealers: choice and flexibility. The new responsive customizable VDP gives dealers thousands of combinations to display YOUR VDP, YOUR WAY. “Though we have always offered a VDP that works well for lead conversion, this new technology allows our dealers to customize their VDP to work best for their market. 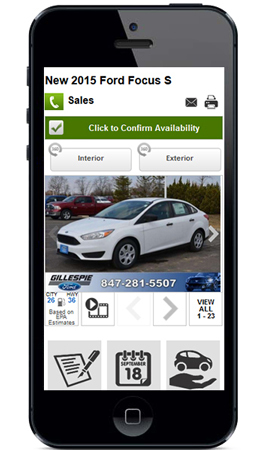 We now have the first responsive platform the truly allows the dealer to take full control, customize and A/B test results in order to make smarter decisions” said Dave Page, co-owner of Dealer E-Process. Now, when dealers sign up for one of our Responsible Responsive Websites (RESS), they will have access to the Custom VDP Editor through Dashboard. The Custom VDP Editor uses a drag-and-drop interface to give users 27 different elements to customize and re-arrange. Twenty-seven different elements in 27 different combinations can create thousands of unique designs on the VDP. Once a dealer has configured their ideal VDP (which includes third party plugins), it can be previewed in responsive website mode so the dealer can see the VDP break down across all screen sizes in real time. The days of wondering how the VDP looks on an iPad versus an iPhone are over as there is ZERO content loss across devices. If the dealer is not completely satisfied with the configuration, changing the VDP is as easy as moving widgets, rejecting all current changes by clicking Custom Reset, or resetting to the default configuration by clicking Master Reset. Once the dealer has complete satisfaction with their VDP layout, they can click Publish to see updates go live on their website. This tool also allows for future customization by dealers including button color & labeling, vehicle pricing configurations and more. If a dealer wants to highlight certain information, they can strategically place the content in different areas to test the customers’ behaviors and responses. Third party vendors, such as CreditMiner, PureCars, Black Book, CarProof, Carfax, and FlickFusion etc. can be easily integrated into the customizable VDP so that dealers don’t have to worry whether or not their vendor‘s application will function properly. Not only will these third party applications work on our responsive platform properly, but the dealer can hand pick the placement of the third party plugin on the VDP.